The Deserted Village of Feltville/Glenside Park, nestled in the Watchung Mountains, has a history dating back more than three centuries. Restoration of the village is part of an ongoing effort by the Union County Department of Parks & Recreation to rehabilitate the buildings, which tell the rich history of this area, from its farming days to a vacation escape from the city. Over the course of three centuries, this area nestled in the Watchung Mountains of New Jersey, has been a farming community, a quasi-utopian mill town, a deserted village, and a summer resort. The grounds are open daily to visitors, while the Church/General Store is open weekends and most holidays. The renovated Masker’s Barn is open for special events and private parties. Plans continue to revitalize the Deserted Village and tell its story to future generations. There is a self-guided walking tour of the Village that is about one mile long. Some of the houses in this Village are inhabited; others have very weak porches. Therefore, you are asked to not walk up onto the porch of any building except the restored Church/Store Building. This is dedicated to Edward Engel, who loved staying in “Uncle’s” cottages when he was a child and who led us to Roberto de la Selva. My grandfather, who was a historian and genealogist, gave me a lifelong love for the grouping of ten buildings that still stands today as the Deserted Village of Feltville. One of my early memories is being featured, along with my siblings, in various photos illustrating a newspaper story about the Village. When I found that my grandfather had collaborated with a friend on a book, now out of print, about the Deserted Village, I determined that I would write a new, much expanded book, drawing on my skills as a freelance writer, rather than on any training in history. I have learned history through the lens of the Village. When I researched the earliest European settlers at the site, I learned that New Jersey, one of the last of the original colonies to be settled, had been given by England’s king, as he came out of exile, as a reward to the soldier-brother who had kept the king-to-be safe. Of course, the king had no claim to the gifted land—not only was it occupied by various groups of indigenous peoples, but other European countries had also established claims and settlements there. The brother went on to himself twice give away land comprising the State of New Jersey, and cause nearly a century of real estate litigation. Researching the Deserted Village, I learned about Revolutionary War soldiers, about the life-saving impact of rubber blankets and tarps during the Civil War, about mill villages, and that the City of Newark was the nation’s unhealthiest city in the late 19th century. Indeed, it was crucial to get out of New Jersey’s cities, perhaps to the small resort that the Village had become, if you wanted to stay alive. In the 1992 book of that name, Helen Delpar examines the expanding cultural relationships between the United States, Mexico, and other Latin American countries during the period from 1920 to 1935. Trade with Latin America and fascination with its art led to a Latin American sculptor coming to the Village to paint murals, likely the only murals he ever did, on the walls of one of the buildings in the Village. But the Deserted Village illuminates one more sad fact of history—many, or at least most, people leave little trace of themselves behind, and piecing together the story of a set of murals in a backwater New Jersey location becomes a combination of perseverance and just plain luck. Worse still, some details may always remain a mystery. On a rainy day in 1975, the Deserted Village of Feltville was serving as the headquarters for group of young CETA volunteers, who were performing various maintenance jobs in the Union County-owned Watchung Reservation. The Comprehensive Employment and Training Act (CETA) had been enacted by Congress and signed into law by President Richard Nixon in 1973, and was meant to train out-of-work or underpaid individuals so that they could develop marketable skills, which would enable them to find jobs in the public or private sector after their CETA service was done. During CETA service, the “volunteers” were paid at levels less than prevailing wages. On that particular day, since the CETA volunteers could not work outdoors, they were assigned to strip wallpaper from the walls in one of the Village cottages. On the first floor of the cottage, they soon found themselves uncovering brightly colored murals, which were painted directly on the cottage’s plaster walls. The murals depicted natives in various settings, including a pair of murals on either side of a central window on the front wall of the cottage that depicted natives in worship, juxtaposing ancient religious practices with the Catholic ones brought by invading Europeans. The murals were all miraculously uncovered nearly intact. Then came speculation about the identity of the artist, and a wild hope—could Diego Rivera have painted these murals? More than a decade later, Bill Higginson, an internationally recognized haiku poet, was visiting the Deserted Village. Higginson, then serving as Administrator of the Union County Office of Cultural and Heritage Affairs, was in the Village as part of a program created by his office called “Project Archeology.” This was a program for fifth-grade students meant to introduce them to archaeology. Students were taught proper and careful archaeological digging practices by uncovering real artifacts that had been planted for teaching purposes in an artificial site. It is in the remnant of these old houses, considerably beautified and restored, that the Glenside Park colony lives, last owned by Edward J. Grassmann of Elizabeth but now belonging to the Union County Park Commission as part of the reservation. Most striking of the homes is that of Mrs. William D. Sherman, with ten low ceilinged rooms and three stories overlooking a deep ravine . . . a sunny-roomed house with wide-boarded floors where every door latches and there are no doorknobs. Around every wall of the living room are giant Mexican murals faintly reminiscent of Rivera . . . brown, ovalled women, sombreroed men, and a Mexican god whose eyes gleam and turn under shaded lights. Their story is unique. When Mr. Grassmann lived in the house he happened, on a visit to New York, to meet a Spaniard down on his luck and invited him to live at the Glenside Park home with the caretaker during his absence. The stranger offered to paint the living room walls and Mr. Grassmann agreed, feeling that a coat of whitewash could be put over them inexpensively if he didn’t like the decorations. While Mr. Grassmann was away, the caretaker phoned to complain that the “painter” wasn’t putting in his eight hours a day but spent most of his time lounging around smoking cigarettes. But when the latter returned, he was amazed at the artistry displayed in the murals and upon inquiry, found that he had been entertaining a famous South American mural painter unawares. Since then he has offered anyone $1000 to remove the murals unharmed for him from the plaster walls. 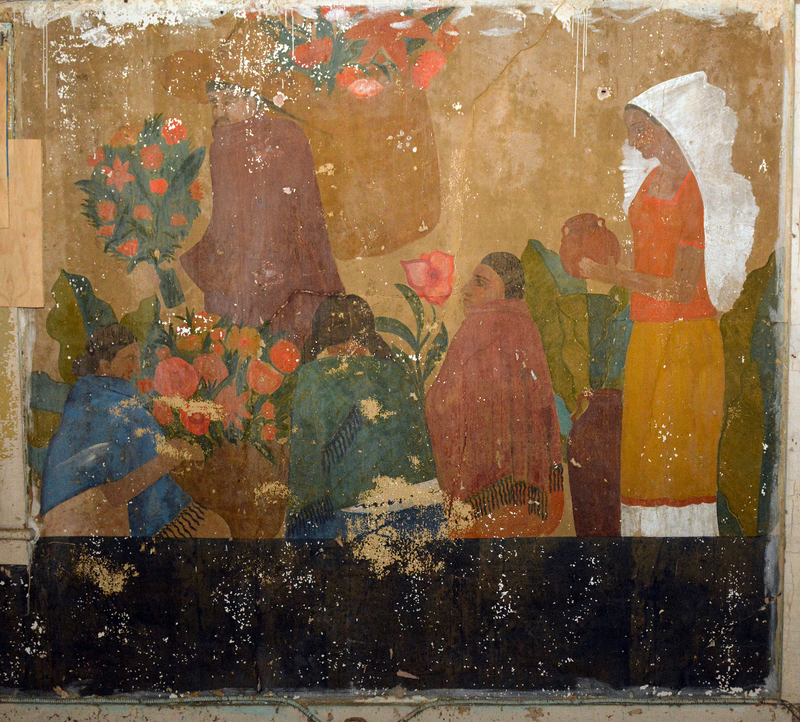 Resolving to prove the significance of the murals, and protect them from destruction, Higginson approached a young curator at the Montclair Art Museum for help. Alejandro Anreus, born in Havana, Cuba, with a B.A. in Art History from Kean College, had already begun to develop an expertise in Latin American art, and was then a curator at the Montclair Museum. Anreus, now a Professor in the Art Department of William Paterson University, would go on to get a M.A. and Ph.D. from the Graduate Center, City University of New York. Higginson asked Anreus to reach out to his already-broad circle of experts on Latin American art to document the value of the murals, regardless of whether the actual artist could be identified (but hoping that he would be found). Anreus could immediately see that the murals were not the work of the famous Mexican artist, Diego Rivera, although he felt they showed Rivera’s influence. Anreus sent photos of the murals to his, Luis Cardoza y Aragon, a well-established scholar of Latin American and Mexican art. Let me write a little bit of me so they know I am not some improvised old fool. I was born in Guatemala (was a socialist senator there during late 40s), have lived in Mexico on off since late 20s, graduated from Sorbonne with degree in art history, I am a poet, translator of Breton and Stevens, wrote first monograph on Mexican art in 30s, have over 20 books on log last year, I am professor emeritus of Universidad Autonoma (M.D.F), Catedra de Historia De Arte Latino americano. … practically impossible for anyone to identify the author; that style (if work was not signed) was very popular in late 20s & 30s, but the point that can be used to justify the works is that they are the earliest example of Mexican mural influence to be found in the area (you say dates are circa 1927-9? ), also three of the panels show direct influence of Rivera’s Secretariat of Education murals … so this assures me that whoever the author was, he or she had to have seen Rivera’s work in Mexico City. Cardoza y Aragon also recommended consultation with his colleague, Dr. Gomez-Sicre in Washington. Jose Gomez-Sicre was a Cuban who had trained as a lawyer, but had spent over 50 years promoting Latin American artists and art. A listing from Who’s Who in America 1986-87, apparently consulted by Higginson’s office for background on Dr. Gomez-Sicre, notes that Gomez-Sicre was an art specialist in the Organization of American States from 1946 to 1973 and Chief of the Division of Visual Arts of OAS in Washington, DC from 1973 to 1982; also Director of Museum Modern Latin American Art 1976 to 1983. He retired in 1983 but continued to lecture on Latin American art across the globe. After thoroughly reviewing the dozen or so slides of your Feltville murals, I can give you the following expert opinion: they are definitely worth saving, that is restoring them as close as possible to their original splendor. Not only do I think they are important chronologically but also stylistically; they show Rivera’s influence without the former’s manneristic tendencies. Your mural’s style is more “naïf”, fresher, bringing to mind the work of Rodriguez Lozano and Abraham Angel. Again, I believe, after 50 years of experience in the world of Latin and North American art, that these works are worth saving. Mr. Higginson’s efforts saved the murals from being renovated away, but as time went on, the County found its resources unequal to the upkeep of the ten Village structures, many of which, including the murals cottage, were vacant. The murals cottage developed roof problems and leaks, with rainwater pouring down the walls. Moreover, in an effort to discourage nearly constant vandalism in the village, all the windows of the murals cottage were boarded up, which trapped moisture and condensation inside. All of this had harmful impacts on the murals. Recognizing the condensation problems, an historic preservation architect had the County install screens and fixed louvers in place of some windows to allow the house to breathe. Still, when I visited the murals for the first time in the 1990s, several murals, especially those which had been under the torrents of falling rainwater, already looked beyond repair, and others exhibited flaking paint. Hoping to prompt the identification of public resources somewhere to save the murals, I identified three conservators with expertise in the type of restoration necessary, who were each willing to make a visit to the Village and make a proposal for the preservation of the murals. I was already at that time engaged in writing a new history of the Village. Previous short books on the village had been written in 1947 by Dr. Arthur L. Johnson, County Superintendent of Public Schools, Union County, NJ, and in 1964 by James Hawley, a friend and genealogical colleague of my grandfather, Edwin A. Baldwin. In an effort to help me supplement my somewhat sparse set of historical materials, the County of Union, an ally from the start, sent out a press release about my efforts. Edward Engel was one of the people who contacted me as a result of the press release. Engel was a nephew of Edward J. Grassmann, who had owned much of the Village, including the murals cottage, prior to its acquisition by Union County. Engel was engaged in sifting through the papers of his uncle, who had died childless in 1973. He and his sister, Mary, arranged to meet with me to be interviewed and to go over files related to Grassmann’s ownership of the village. As a matter of interest, I am enclosing a circular pertaining to an exhibit by the artist, Roberto De La Selva. Mr. De La Selva is a Nicaraguan, who did the paintings on the walls of cottage #7 at Glenside. The unknown artist was unknown no longer. But mysteries still remained. I began to piece together details regarding Grassmann’s ownership of various cottages at the village, and particularly details of the elusive artist who had painted the murals. Feltville had been created and used as a nearly self-contained mill village from 1845 to 1860. Later, wealthy businessman Warren Ackerman was persuaded to create a small resort at the village, renovating the mill workers’ cottages for guests, and building a barn for their horses and carriages. The resort had been a getaway from the killing heat and disease of New Jersey’s cities from the 1880s through at least part of the first two decades of the twentieth century. But in 1919, the entire village was put up for sale at a major auction, not in one piece as it had previously been sold, but divided into a set of larger and smaller individual parcels. Each of the surviving cottages was to be sold separately, with only a small house lot. Some larger lots might include fields or forested tracts. A large glossy folio, with maps, verbal descriptions of each parcel, and photographs of many of the cottages (taken from the earlier Ackerman resort brochure) was circulated to prospective buyers. Edward Grassmann was able to purchase at least three of the lots at the auction itself, and then spent considerable effort tracking down purchasers of the other lots, buying some additional lots in an effort to own all of the Village property. Cunningham’s book describes Grassmann as “unmatched in his knowledge of New Jersey land, particularly in the so-called Jersey Meadows . . .” Grassmann became a surveyor’s apprentice at age 14, working on surveys of the Jersey Meadows, going on to earn a degree in civil engineering from Cooper Union Institute in New York City, and eventually also becoming a full-fledged surveyor. He used this background to develop a business in Elizabeth, combining work in land surveying with the mining and processing of kaolin clay, which is still used primarily to give shine or smoothness to paper, such as in magazine pages. Grassmann’s Georgia mines apparently remain active to this day. Ironically, Edward Grassmann was also the Surveyor General of the Board of East Jersey Proprietors, one of the original parties to the decades-long litigation over the ownership of the land the Village would eventually be built on. Grassmann employed a caretaker and chef at the Village, and regularly entertained colleagues, customers and his family there. Having no children of his own, every week he invited his sister and her husband and children–the Engel family–to come to Sunday dinner at the village. In summer, the Engel family spent a month or more in “the country.” Edward Engel was the oldest boy, and would grow up to be his uncle’s protege and eventually take his place as Surveyor General of the East Jersey Proprietors. Ed fondly remembered being at the Village in the 1920’s. Ed and his brother, Joe, climbed around the old mill, although they had been forbidden to. Of course, they tried to keep their little sister, Mary, the baby of the family, out of the mill, but she too snuck in when she could. There were also the old tennis courts for the children to use, and the daily climb down the bluff to the spring to collect the water which their mother thought was purer water than that of the well that served the houses. Mary even tried once to sneak into one of the evening parties that Grassmann gave for groups of men friends, including the County Police. Perhaps she expected to find illicit activity–but she found only poker, with the winner donating half of any winnings to charity. Still, she was gently sent away. Mary remembers riding with “Uncle Ed” Grassmann in his Model T along the winding and rutted roads that led up to and through the Deserted Village, past the sign that warned drivers to “Sound Klaxon,” the then-used word for the car horn. Mr. Grassmann’s work as a civil engineer took him all over the world. He developed a special fondness for Mexico, Latin America and the Southwest. He decorated two of the cottages at the villages as backdrops for related passions–Mexican and American Indian art. In the “Mexican Cottage,” Grassmann greeted his visiting family and the other guests that he often invited to the village. Dinner was served next door, at the “Indian Cottage.” Ed and Mary remembered a mountain lion and a bear skin in this cottage, each with the stuffed head of the animal still attached. One year in the later 1920’s, the three Engel children found a “Mexican” artist at work painting murals on the walls of the Mexican Cottage. It was an artist named Roberto de la Selva, who, on his first visit to the United States, had been somehow persuaded to come out and paint native subjects on the walls of a cottage in a tiny New Jersey village. Although Roberto was born and spent his early years in Nicaragua, he had left Nicaragua in 1921 to settle in Mexico, a move characterized in materials written about Roberto as a kind of exile. In part he was protesting U.S. foreign policy in his country. Each time Nicaragua seemed on the verge of choosing its own government, the U.S. Marines would appear, and magically whichever candidate was U.S. backed would win the most votes at the polls. Under the governments thus-installed, Nicaragua had given U.S. bankers control of their banks and railroads–and had signed away rights in perpetuity to a strip of land across the country for building another canal like the Panama Canal. Also given in perpetuity was the right to maintain a military base in Nicaragua, supposedly to protect U.S. growers and businessmen there, as well as the Panama Canal–which was also under U.S. control indefinitely. One of Roberto’s bothers, Salomon, a world-famous poet and journalist and the first Latin American to be nominated for the Nobel Peace Prize (in 1919), wrote articles in La Tribuna and La Prensa of Managua criticizing the ongoing U.S. intervention in Nicaragua. For this reason, Salomon and a fellow journalist, Adolfo Ortega Diaz, were barred from Nicaragua by then President Jose Maria Moncada. In spite of any animosity towards the United States that might have arisen from its interference in Nicaraguan politics, Salomon had first come to the U.S. in 1906, and began lecturing at Columbia University around 1916 or 1917. Meanwhile, Roberto had settled in Mexico, and began study at the Academy of San Carlos, which had been founded in 1781 as the first art academy and art museum in the Americas, and which is well known for its association with such artists as Jose Maria Velasco, a mentor of Diego Rivera. Upon Roberto’s graduation from the Academy in 1925, he moved to New York, where Salomon was still teaching. It was during his next four years of residence in the New York area that he was persuaded to paint the murals at the Village. The murals Roberto painted depicted natives at work, play, and at worship. Roberto painted natives with statues of both the ancient gods and the Virgin Mary–a Native American dichotomy that had existed since the first European settler had arrived in the New World. Carleton Beals, a left-leaning journalist of the 1930’s, enthusiastically proclaimed Roberto to have begun an entirely new genre of art–and to be the “Mexican” artist least affected by European influences. Beals, more famous for accounts of the Scottsboro case and the “trial” of Trotsky in Mexico, seemed, in his critique of Roberto’s pieces, to be setting up a rivalry between Roberto’s art and that of contemporaries- even Diego Rivera. Interestingly, Roberto himself wrote a series of articles, setting up a similar rivalry between the art of Rivera and that of Jose Clemente Orozco, with a clear preference towards the former. his particularly “Mexican” pieces, turned to a study of the ancient art of the Maya and Aztecs. Roberto traveled to and lived in small villages in Mexico and Guatemala to learn from the living practitioners of such art. As noted above, if Roberto had originally learned to hate the U.S., its people did not reciprocate his feelings. A growing nationalism after the first World War had led the U.S. to a new appreciation of indigenous art forms–both above and below its borders. The most famous examples of the “Enormous Vogue” are Diego Rivera and his wife, Frida Kahlo. As Drs. Anreus, Cardoza y Aragon and Gomez-Sucre had determined, Roberto de la Selva was influenced by Diego Rivera, and indeed, spent some time marketing or promoting Rivera’s paintings in the United States. Roberto died in 1957. The vogue over Mexican art and things Mexican had disappeared in the U.S. The murals were covered with wallpaper, and it was only the serendipity of a rainy day that brought them back into view. I wake up at nights worrying about the murals flaking off the walls of the cottage at Feltville. At one point, because of my worrying, and working with Dan Bernier and the County, I volunteered to find three conservators whose expertise would allow them to come in, inspect the murals, and tell us what had to be done to preserve them. One of the conservators told us that the remnants of wallpaper paste, surely left behind when the CETA volunteers first removed the wallpaper, were contracting, helping pull the murals off the walls faster even than the deteriorating condition of the cottage. Later, Grace Elizabeth Knyfd Seaman chose the de la Selva murals as the subject of her thesis at Kean University. She used much of the research I had done about the Village, and what I had been able to piece together about de la Selva, and photos which had been taken earlier of the murals as well as state-of-the-art digital photos which allowed greater editing possibilities. Ms. Seaman concluded that it would be valuable to use technology to digitally “restore” the murals, as a first step to eventually physically restoring them. Students in a Dr. Seaman’s Glen Ridge High School Advanced Computer Arts Class were granted a tour of building #7 to enhance their understanding of the work as a whole as they took on the painstaking task of creating digital restorations of some murals, which will be invaluable to any future restoration effort. The County of Union has been following a master plan developed in 1985 as its guide to restoration of the Deserted Village of Feltville. In 1992, all ten of the extant buildings were stabilized. The building that served as the mill town of Feltville’s general store and church was restored in 1998 and is now outfitted with museum exhibits as a Visitor Center that is open to the public on weekends and holidays. The resort period carriage house, called Masker’s Barn, was restored in 2011 and is now rented out for meetings, lectures, birthday parties, showers, weddings and fundraisers. It is estimated that at least 75,000 people walk, jog, hike, bike, ride horseback or get pulled by a dog through the Deserted Village’s 130-acre grounds annually. The master plan proposes restoration of House #7 and the de la Selva murals as its next major project. But the County of Union must first find the funding. When it does, I can stop waking up at night worrying about flaking paint. The Union County Department of Parks and Recreation hopes you are enjoying your stroll through the Deserted Village. While there is still much work to be done, what you see could not have been accomplished without the support of the Union County Board of Chosen Freeholders; the New Jersey Historic Trust; the Union County Open Space, Recreation & Historic Trust Fund; and other contributors. Nearly $4.7 million has gone towards building infrastructure and stabilizing and renovating the historic buildings. Masker’s Barn and the Church/Store are the cornerstones of the Deserted Village restoration project. Gas, water, sewer and electrical lines are now in place to enable preservation of additional buildings and use of them by the general public. The work is far from done, as we hope that one day visitors will be able to walk Cataract Hollow Road and get a true sense of life in David Felt’s mill town or the Glenside Park resort. To learn more about the Village’s history, check out: ucnj.org/dv.